This fruity drink recipe combines pineapple juice, berries and blackberry lemonade drink mix for the perfect refreshment on a hot summer day. Enjoy this quick and easy drink recipe at your next family picnic. Blend tap water and strawberries in blender until smooth; pour into 1.5-L plastic or glass pitcher. 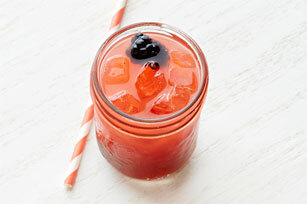 Serve in 250-mL glass preserving jars garnished with additional berries. Pour additional sparkling water into ice cube trays. Add 1 each blackberry and small piece of chopped strawberry to each section; freeze until firm. Add to glasses before filling with prepared drink. These tasty spritzers can be part of a healthy eating plan. And as a bonus, each serving provides an excellent source of vitamin C.